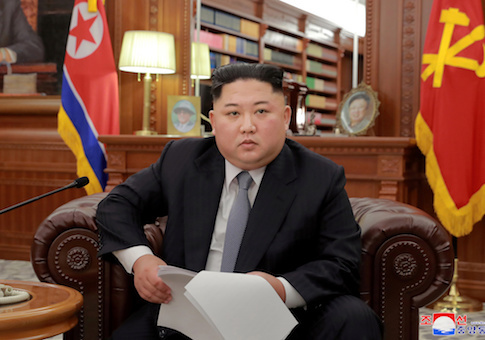 SEOUL (Reuters) – In his New Year address on Tuesday, North Korean leader Kim Jong Un warned he might take a "new path" if Washington maintains sanctions amid his country's push for economic development, but experts say it may be too late to change the trajectory of negotiations. Kim did not specify what the new approach might be. His warning may sound similar to the bellicose rhetoric that Pyongyang often deployed before last year's summit, but he cannot jeopardize the hard-won thaw and has few options beyond appealing directly to U.S. President Donald Trump, experts say. State media have in recent weeks accused the State Department of risking returning to "exchanges of fire" of the past by ramping up sanctions, while crediting Trump for his efforts to continue talks. Q: IS THIS A SIGN OF FRUSTRATION? A: Kim vowed to work towards denuclearization at a summit with Trump in Singapore in June. But since then there has been little progress, with a high-level meeting between the two sides canceled abruptly in November. Pyongyang has demanded Washington lift sanctions and declare a formal end to the 1950-53 Korean War in response to the dismantlement of its Punggye-ri nuclear testing site and a key missile engine facility. Despite goodwill responses from Washington, such as a halt of some major military exercises with South Korea, U.S. officials have said North Korea‘s initial steps were not confirmed and could be easily reversed. U.S. Vice President Mike Pence said North Korea would not be forced to provide a list of nuclear weapons and locations, and a U.S. nuclear envoy offered to facilitate humanitarian aid. But Kim's speech on Tuesday called for a "complete end" to all joint exercises and slammed the sanctions campaign. "His message was ‘we have done what we said we would at Singapore, but the United States has done very little in return,'" said Vipin Narang, a political scientist at the Massachusetts Institute of Technology. Q: WHAT DOES ‘NEW PATH' MEAN? A: North Korea‘s state media has stepped up criticism of the United States, warning of a return to the era of confrontation if sanctions and pressure continued. But that indicates Pyongyang's frustration rather than the "new path" Kim suggested, experts say. "His speech chiefly emphasized the need for a fair deal, and it's extremely unlikely for them to go back," said Cheong Seong-chang, a senior fellow at South Korea‘s Sejong Institute. Instead, "new path" may refer to focusing on concessions that don't involve broad denuclearization in favor of action-for-action commitments. South Korea‘s Unification Ministry said on Wednesday it could not speculate on what the alternative path might be, but Kim showed his "clear resolve" to abandon the weapons program and improve U.S. ties by mentioning "complete denuclearization" himself for the first time. Kim Joon-hyung, a professor of international politics at Handong Global University, said one possible scenario was theNorth‘s dismantling of the Yongbyon nuclear complex, as offered at an inter-Korean summit in September in Pyongyang, and acknowledging some facilities in return for eased sanctions, such as a partial restart of inter-Korean economic projects. Kim Jong Un said in the speech he was willing to reopen the Kaesong factory park and allow access to the North‘s Mount Kumgang resort "without conditions." Yet there remains an opportunity to limit Kim's arsenal, Narang said. "The United States should find out what the price for a cap on North Korea‘s nuclear program would be, as it would be an important and realistic objective," he said. Q: DOES NORTH KOREA WANT TO SHIFT ITS FOCUS FROM AMERICA? A: The New Year address called for a launch of multilateral talks to officially declare an end to the Korean War, an idea also floated previously by South Korea. That could mean working with China, South Korea and others in pressing Washington, professor Kim said. But other experts, including former South Korean nuclear envoy Lee Soo-hyuk, were skeptical that would happen given the deadlocked bilateral talks, the Sino-U.S. trade war and Trump's dislike for multinational mechanisms. "This will not be easy, and neither side will achieve outright success, but diplomacy is possible," said Patrick Cronin, chair for Asia-Pacific security at the Hudson Institute in New York. "China and others may also be invited to play a role." The post North Korea Warns of ‘New Path', But Options Limited appeared first on Washington Free Beacon.